With new CEO Jack Dorsey at the helm, Twitter is rebooting. After months of floundering to find a new CEO and shore up its user base, Twitter is having the best week ever. First, the publishing platform confirmed that cofounder Jack Dorsey is retaking the helm as CEO of the company he created. Now Twitter is officially rolling out a feature that will make it much easier for people to find the best and most important tweets of the day without having to hunt for them. The new tool is called Moments, and it will be easily accessible in a new tab on Twitter for iOS, Android, and the web. Rolling out today for U.S. Twitter users, Moments will offer a curated list of current events in a variety of categories—news, sports, entertainment, etc.—and let you tap through to see more information about the moment and the most relevant tweets about it. Those tweets can be text only, or they can include GIFs, videos, photos, and Vines. Each Moment will include about a dozen tweets to swipe through so you can stay on top of the day’s most important events. If you don’t see the tab, marked with a lightning bolt, right away, don’t worry: It’s coming. Perhaps most importantly, you can follow a Moment to see tweets about the event in your main feed, removing the work of hunting for and following people who are tweeting about an event and then unfollowing them when the moment passes. You can share a moment with a tweet, or embed it on the web, just like you can retweet and embed normal tweets. Twitter is curating the list of Moments to start, but has also partnered with Bleacher Report, Buzzfeed, Entertainment Weekly, Fox News, Getty Images, Mashable, MLB, NASA, New York Times, Vogue and the Washington Post, who will all contribute their own Moments. 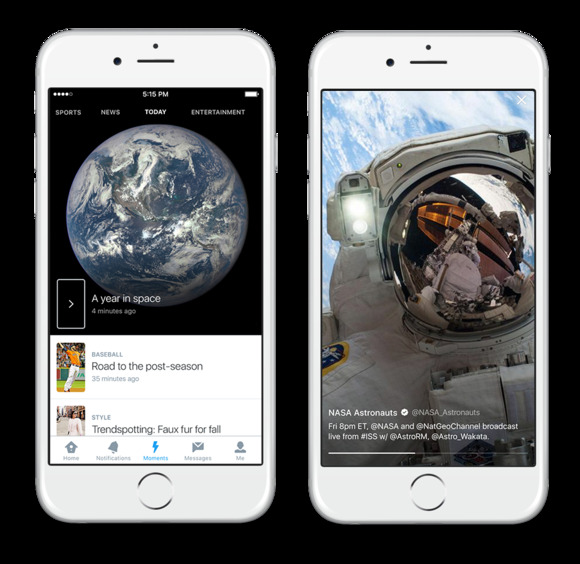 According to the New York Times, Twitter will eventually let all users curate Moments. Unlike your main Twitter stream, Moments will be ad-free—at least for now. The story behind the story: Moments will make Twitter super simple to use for newcomers who aren’t familiar with the network or are unsure of who to follow and why. Even if you don’t follow a single person, Moments will make Twitter accessible to you, which is what the network desperately needs to grow. And the ability to follow Moments without following a slew of users—thereby forever cluttering your home Timeline—also makes the feature useful for Twitter’s power users. Twitter needs a shot in the arm. Its growth has stalled at around 316 million monthly active users. Many people have already tried the service since it launched in 2006 and found it confusing. New CEO Dorsey has his work cut out for him, but Moments is a huge leap in the right direction.